Sign up for the following community programs, On Line, In Person or Mail In. A pdf of the Fall Community Brochure is available on the web site. At this time we are working on wrestling classes for elementary school students and for middle school students. We are also working on a winter ice skating program. As these programs are finalized the details will be listed in the Fall Brochure and on line. If you have an idea for a community program or if you would like to lead or teach a program for the community please call the office. We will work with you. Ages 7-12 12:00 p.m. – 1:00 p.m.
Ages 13– 17 5:00 p.m. – 6:00 p.m.
Children will learn the lifelong sport of tennis in a fun, positive environment using age appropriate size balls and equipment. The program will teach and reinforce proper stroke technique, basic rallying skills and introductory play. Ask about Match Play! families. The motorcoach leaves Saturday early morning from the Recreation Child Care Center, 14 Library Plaza, and returns early evening Sunday night. Students welcome with an adult. Cancelations received up to 35 days of departure, $50.00 fee. Cancellations received 34-16 days before departure – $150.00 pp fee plus applicable tour/ticket penalties. No refunds for cancellations received less than 16 days before departure. Please note any health /mobility restrictions. If you require assistance, you must travel with a companion who will help you throughout the trip. Note: Triple/Quad accommodations have 2 full –or queen-sized beds. A cot may be requested. This fall we are pleased to offer Kids Fit is offered at the Daniel Webster, Eames Way and Martinson Schools. We offer two 5 week sessions. Please refer to the Fall Brochure for details on days, times and cost. You saw it at the Olympics and now you can play it in Marshfield. The badminton program will focus on increasing fitness levels and endurance of participants in a fun and energized environment. Focus will be on introducing badminton techniques and strategy while developing basic strokes and footwork, game play and having fun! Come dressed and ready to play! Remember to bring your racquet. Recreational play, ideal for those who have played previously. Instruction offered as needed. Basic rules are followed. Come dressed and ready to play and bring a Friend!! Details on Fall Community programs are listed in the Fall Brochure. We accept Walk In, Mail In and Online registration. As additional programs are finalized we will post them online. Recreation Directors, goodbye to Ned and welcome Craig!! Every day we make difficult decisions, one door closes and another opens. 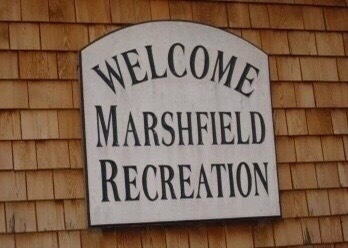 I would like to express my gratitude to the town of Marshfield for taking a chance on me. I have been fortunate to be able to work here; I feel that I have had one of the best jobs around. My college professor informed us that we should be prepared for a career which includes nights, weekends and holidays. Truer words were never spoken. We have witnessed many changes, from typewriters and pagers to seasonal community brochures, online registrations, cell phones, email and texting. Our office grew from a small 3 x 6 space with one window and no heat to our site at Coast Guard Hill, with a/c, ballfields, gardens, green house, sledding hill, sand vb courts and the best view around from the top of Coast Guard Hill. Parks and Recreation has the capacity to touch every person, whether a small child or aging adult, whether a new resident or lifelong community member. This has not been a job, but rather a way of life for me. Our profession has the unique opportunity to influence the lives of an entire community, this is what excites me. Working together, we established a variety of community programs and traditions, I will cherish these memories and the many co-workers, volunteers and families we worked with. My last day in the office will be Friday, October 21. Please welcome Craig Jameson as the new Marshfield Recreation Director. Craig is a New Hampshire native, and a graduate of Endicott College with a BS in Sports Management. Craig has experience with coaching, fundraising, YMCA’s (Before and After School Site Director) directing summer camps, pre-school, teen and vacation programs, field trips and more. Craig is a Marshfield resident and most recently worked as the Athletic Director at the Boy’s and Girl’s Club of Marshfield. As the Athletic Director Craig developed programs and activities for preschool children to adults. Craig has related social media experience, look to an increased use of these skills as programs are promoted on Facebook, youtube, twitter and more! Craig starts work on Monday, October 17. We will busy week as I show him our many facilities and we review our community programs. Please help us welcome Craig to the department!! Bradford Ski & Snowboard Club is available for registration as of Monday, October 17th.